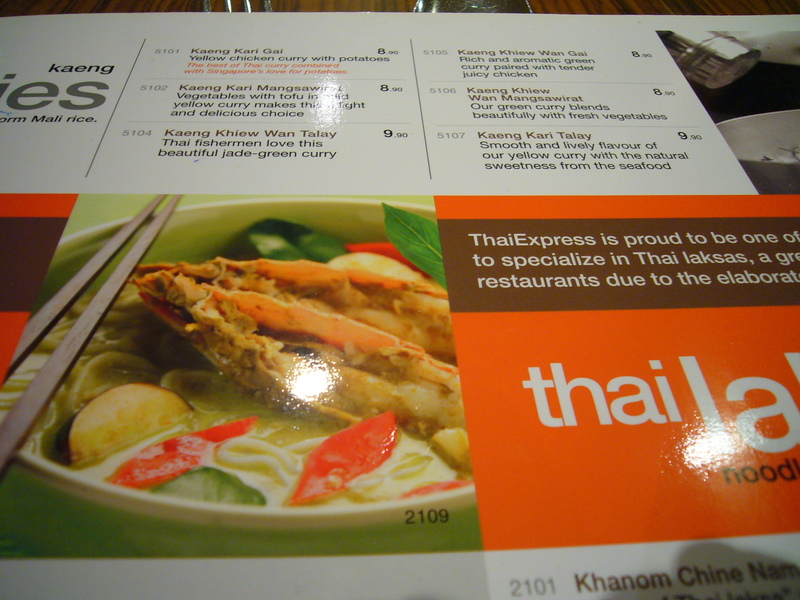 I and my class are having our dinner at Thai Express to celebrate the end of our poster symposium. I can't remember the last time I had eaten Thai food but I decided to test my tolerance by ordering their hot and spicy seafood curry - Kaeng Kari Talay. The serving given to me was pretty large and seriously, 1 bowl of puny rice is simply not enough. I ended up ordering 2 bowls of rice and that translates to lots of carbohydrates! Oh no, time to go exercise soon or risk getting fat~ =p The curry is indeed as the menu promises - smooth and rich in flavour tinted with the sweetness from the seafood! The thing that leaves a deep impression in me is their prawns. They are so fresh and cooked to the right timing that they are all extremely springy and juicy!! In addition, once I started eating and mixing the rice with curry, I couldn't stop and crave for more even though my tounge was already burning hot!! The price, in my opinion, was reasonably set at $9.80 and I guarenteed that you will be full when you finished up the meal. The only bad point that I can say about the curry is that I find it a little too salty. Service wise, I find that the waiter and waitress there are good and up to their job. Empty cups or half-full cups are promply filled up when they walked past us and the timing from placing our order to serving the food are all done in less than 15 minutes. Before payment, they reminded us again if we had any of the promotion cards with us so that we can enjoy the discounts. A job well done indeed. This outlet is much spacious then a few other outlets I have went to. Without fail, it's pineapple rice and green curry again. My sister and nephews just love eating at Thai Express. Except for being abit too cold, the service is v fast here even during peak hours compared to the smaller outlets in the heartland area. They have much efficient staffs available too. 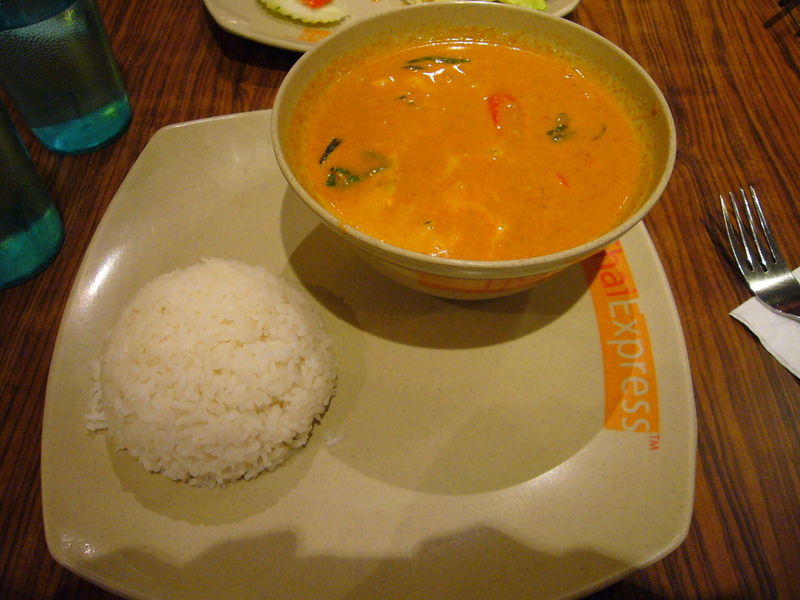 to me, most thai express outlets i visit have generally serviceable food. nothing to rave about, but no complaints. vivocity branch is no different. green curry with seafood: i love all curries so this was good. soft shell crab with secret batter: we asked the waiter what the secret was. no luck there haha! rather disappointingly small piece of crab, turned soft quickly. olive rice with chicken: i love the accompanying sauce! the olive rice is strangely..crunchy. but not unpleasant. oh and it is freezing. haha true! oh i learn that word from 8days one. I LOVE 8days.